Is this flavoring sauce measured in fluid ounces or by net weight? While the item's packaging displays its net weight, the amount of fluid ounces per bottle is featured in the item's title to provide you with how much available product each bottle contains. Perfect your signature espresso-based drinks with Ghirardelli 64 fl. oz. caramel flavoring sauce! Made with premium ingredients, this sauce has a creamy, slow-cooked caramel flavor and velvety-smooth consistency for crafting your coffee shop drinks. Use it for lattes, frappes, milkshakes, and even frozen cocktails. Besides beverages, this indulgent caramel sauce is perfect for topping ice cream, frozen yogurt, cheesecakes, and many other decadent desserts. Not only does it enhance the taste of your tempting treats, but it also improves the look and presentation of your offerings to delight patrons and help boost impulse sales. Customers will recognize and trust the Ghirardelli name when they see it in your cafe, coffee shop, ice cream parlor, or restaurant. Ghirardelli began with a young Italian chocolatier in the early 1800s and is now a brand widely known for its rich flavors. This sense of quality is the result of Ghirardelli's commitment to control all steps of the chocolate-making process, from roasting the cocoa beans, to refining the product for smoothness and well-balanced flavor. In addition, the company understands that sustainable sourcing and knowing the origins of the cocoa beans speaks to the quality of the finished product. No matter what dish or drink you prepare, guests are in for a treat with this caramel flavoring sauce! 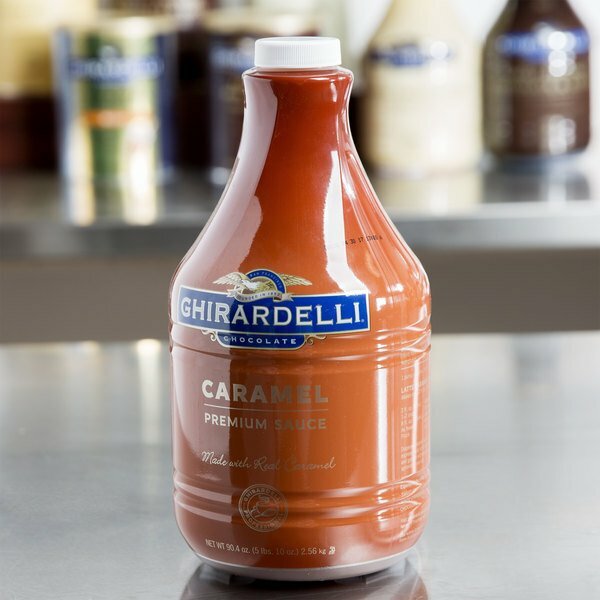 The Ghirardelli Caramel Flavoring sauce is perfect for my company needs, we use it as a cover to our ice cream desserts. Its a high quality Product! This Ghirardelli premium caramel sauce is so delicious drizzled over ice cream. It has a very nice rich Carmel flavaocr ans a creamy smooth texture. This caramel syrup is so versatile! I love using it to make my ice cream at home in my ice cream machine. It has a nice golden caramel color and the consistency is not too thick. This tasty Ghirardelli Caramel is one of our most popular sauces. Plus, you actually get 90 oz not 64 oz as listed! Bonus! Buy It! You can't go wrong with Ghiradelli! This is a very marketable product which creates high demand for our ice cream products. The caramel is very rich and a popular add-on at our ice cream shop. I would highly recommend this product. A++++ customers love this sauce. We use in a lot of our ice creams as an inclusion AND a topping. It pours nicely into squeeze bottles. This is a thick caramel that is great for frozen and iced drinks. It drizzles well on top of desserts and inside cups for a pretty display. A very nice quality caramel flavoring sauce that is very rich and buttery. A supreme style caramel sauce and the only one we use to make our caramel macchiatos. A very good caramel sauce, I have tried several other brands, this one is by far the very best. It has a very rich caramel flavor. Good quality caramel sauce to use in frappes and lattes. Can not really be used for apple dipping sauce. Good price on this website, buy in bulk when on sale! This caramel is delicious! I am personally guilty of eating a little bit of it just by itself from time to time!! Mostly we use this in our milkshakes and our customers have complimented on how rich and creamy our Caramel Milkshakes are. Delicious! This is the best caramel sauce we have tried and it is the perfect topping for serving ice cream! We transfer to smaller bottles for easier use. This caramel sauce is fantastic. We were using Torani until we tried this and were very impressed. Two pumps in a 12 oz drink is delicious and not overly sweet. 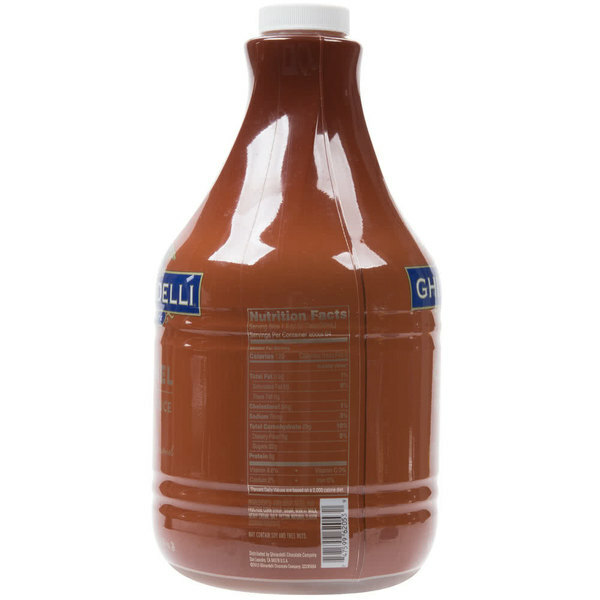 We love the Ghirardelli caramel sauce for our hot cider, lattes and other specialty drinks. The thicker sauce gives the drinks a smoother, silkier texture than using a thin syrup.